Experience the Unparalleled Beauty of Lake Superior's South Shore! The area abounds in celebrations of nature and the arts, and there are all sorts of ways to get out and enjoy one of the most beautiful places on earth - including many parks (including Frog Bay - near the cabin)! Area residents are committed to sustainability and preservation - from the farmers, orchard keepers, artists, outfitters and Hauser's Bayfield Cabin! The Bayfield and Madeline Island chambers of commerce, do an excellent job of keeping visitors up-to-date about events and businesses in the area. You can also go to the Hauser's Bayfield Cabin Facebook page to gain new insights and information. You can subscribe to chamber email newsletters with information about events for the coming weeks and months. You may want to sign up for one or all of these newsletters via the chamber websites before your trip — you can always unsubscribe later. If you enjoy hiking, the Bayfield area offers a wide range of hiking trails. The Trail-link web site offers a nice list of trails as well. Meyers Beach Trail is on the way to Cornucopia from the cabin. It is between Hauser's Bayfield Cabin and Cornucopia just off highway 13 (marked by a sign). This trail requires good hiking boots and takes hikers up along the ridge over Lake Superior. The caves can be seen from above by taking the 1.8 mile hike up the Lakeshore Trail. Although called a lakeshore trail, good views of the lake are rare until you get near the caves. The Brownstone Trail in Bayfield: (5 miles round trip) Easy walking and biking on an old railroad bed which borders the lakeshore heading south from Bayfield. The trailhead access is at the kiosk on Third Street -- kitty-corner towards the lake from Maggie's Restaurant. You'll enjoy splendid views of Madeline Island, boats crossing the channel, and maybe even a black bear in the spring or fall! When you hike this trail in late afternoon or early evening, you can reward yourself with a stop at Wild Rice restaurant, which offers lovely fine dining ($$$), and has a beautiful bar next to an outdoor patio with tables and fireplace. Big Ravine Trail in Bayfield: (2 miles round trip) Hike uphill along the steep, hemlock-studded rim of the big ravine. Take young children by the hand! Trailhead access is on 4th Street uphill to the Bayfield School. Turn left on Sweeny and park at the baseball field. The trail is behind the fence to the right. The Iron Bridge Nature Trail in Bayfield: (1/2 mile round trip) This magical winding trail is for sure-footed hikers, and follows the ravine creek under the old Iron Bridge and uphill to a rocky grotto with small waterfall. Pick up the trail at the Iron Bridge on Washington at Broad Street. Mt. Ashwabay south of Bayfield. Hike the cross country ski trails, with views across the forested valleys. The trails are easy to challenging, depending on your route. Mt. Ashwabay is located several miles south of Bayfield, at the end of Ski Hill Road. Look for the Big Top Chautauqua sign. Sioux River Flats Beach Trail (3.8 miles round trip) Walk along the Lake Superior shoreline from Bayview Park Road to the Sioux River. Access to the long, beautiful beach is five miles south of Bayfield on Highway 13. The Boardwalk Trail between Big Bay Beach and The Lagoon: This easy walk through the delicate dune landscape can be reached from either Big Bay State Park, or the Town Park. Big Bay State Park trails wind through the woods, and around the lagoon — and you won’t want to miss the trail along the point, which is above the “minor sea caves” looking across the lake towards Michigan. This trail gives access to the “jumping off rock” loved by all summer kids on the island — it was even the site of an island wedding in 2010 — the bride and groom stripped to swimsuits after the ceremony and “took the plunge”! Madeline Island Wilderness Preserve trails Capser Trail, an easy trail within walking distance of the ferry, and the North End Trails, which are more primitive, but offer rewarding hikes — especially in blueberry season, are part of the Preserve lands. Visit the MIWP website for more information. The Chequamegon Bay area has hundreds of miles of spectacular road and mountain bike trails and a number of fun biking events! There are many fun biking events! Trek & Trail --- Bayfield. Bike rentals. Motion To Go --- Madeline Island. Bike and moped rentals. Animaashi Sailing Company --- 34' sloop Sarah's Joy. Captained half-day, all day and evening trips. Overnight dockside accommodations available. Located at Bayfield's main city dock. Dreamcatcher Sailing --- Sail the Apostle Islands of Lake Superior near Bayfield, Wisconsin with a USCG Licensed Captain. Learn about sailing on one of three daily trips from Bayfield or the sea cave trips from Cornucopia Harbor. Sailboats Inc. --- Sailing lessons and sailing trips. Sail the Apostle Islands on 25'-40' well-equipped sailboats. Bareboat or captained. Learn how to sail in 3 days. Superior Charters --- Large fleet. Bareboat or captained. Learn to sail. Over 60 boats 26'-46'. Northern Breezes Sailing School --- Vacation Courses are held in the beautiful Apostle Islands near Bayfield, Wisconsin. Manitou Sailing Charters --- Half Day, Full Day and Sunset Cruises from the Bayfield City Dock on a wooden yacht. Living Adventure Inc. This outfitter is just a short drive from the cabin on the way to Bayfield on Highway 13 just past Red Cliff. Instruction, Full, Half-day and overnight trips on Lake Superior, plus Apostle Islands Sea Kayaking Trips. Trek and Trail. Guided Sea Kayak Tours, Rentals, Shuttles, Instruction Courses. In Bayfield next to the Madeline Island Ferry terminal. The Northwest Passage. Sea Kayaking and Camping Trips in the Apostle Islands. Wilderness Inquiry. Sea Kayak and Camping Trips in the Apostle Islands. Their base camp is located very close to the cabin at 33095 Little Sand Bay Road. Adventure Vacations on Madeline Island offers boat trips to the Sand Island and Devils Island Sea Caves, with inflatable kayaks to tour the caves! Lost Creek Adventures Cornucopia. Kayak trips. Stand Up Paddle Boarding rental, Instruction, guided trips, wilderness classes. Madeline Island also has outfitters offering kayak trips and rentals for the State Park cliffs and Big Bay lagoon. See Madeline Island Chamber for outfitter information. Valid State of Wisconsin fishing license is required. Click here for information on obtaining a license either by phone or locally. If you have a boat, the fishing off of Bayfield in Lake Superior near Long Island or the southern tip of Bass Island is usually pretty good — fish for Lake Trout, Whitefish, etc. Fishing off the ore dock pier in Washburn can be good at times. Bridges and piers are good for springtime casting, while trolling proves successful during the summer months. Dave’s Fishing Charters On the Nauti Gal. Capt. Dave smokes, but if you don't mind an occasional whiff, he does a great job, and has been doing it for 30 years. Blackhawk Charters Ken Nourse on the Blackhawk2. Hook & Fin Charter Co. Madeline Island. Captain Josh has spent his life on the water and is living out his dream by being a charter boat captain. He will spend time showing you his "secret spots" and pass along tips to help you catch that big fish you have been looking for. Click for information on Bayfield County Lakes. Click here for maps of Lakes of Bayfield County and their Depths. The best place to fish with public access near Bayfield is on the lakes in the Chequamegon National Forest. Just past Washburn on Hwy 13 is a bait shop on the right. The folks at the bait shop can tell you what lure or bait to use and where to fish, depending on the time of year you are here. Just past the bait shop is Wannebo Road. If you take a right on Wannebo and go about 6 miles, you'll see a sign for Long Lake on the right. There is a hiking trail around the lake and there are some fish in the lake. Just down the road from Long Lake, on the same road you took a right on to get to Long Lake, about 4.5 miles on, is Birch Grove Lake which is probably a better fishing lake. Of course, there are other lakes in the forest as well. Diamond Lake and Lake Namekagon south of Highway 2 off Highway 63 offer the best variety of fish. Want to take a road trip? You can drive down to the Hayward area to fish. The Brule River is another great place to fish. It is the finest spring-fed trout stream in the Upper Midwest. Madeline Island Historical Museum Learn about the rich history of the area. Did you know this was one of the main centers of the fur trade starting in the late 1600’s, under France, then England, then the United States? Or did you know that Madeline Island is sacred to the Ojibwe? Check out their events calendar. Hokenson Brothers Fishery Museum Located at Little Sand Bay - near the cabin. The cabin was formerly owned by the Hokensons. Bayfield Heritage Association BHA maintains a collection of artifacts and archival materials relating to the history of Bayfield and the surrounding region. The collection focuses on the general themes of settlement, agriculture, logging & lumbering, transportation and tourism. Archival materials include maps, early city records, photographs, newspapers, brochures, business records and personal papers. Located at 30 N. Broad Street. Bayfield Maritime Museum Visitors can expect to find displays and activities centered around boat building traditions, sailor crafts and more. Located at 131 S. First Street. Bayfield Winery Ltd Located at Hauser's Superior View Farm. All Sisters Winery Run by Renata & Caitlin Hauser. White Winter Winery in Iron River. Click here for a great list of shops from the Bayfield Chamber. Kelly & Crew, Rittenhouse, Bayfield. Howl, Rittenhouse & First, Bayfield. Brownstone (yarn shop upstairs) and Sweet Sailing, Rittenhouse, Bayfield. Joanne's Scandinavian, Rittenhouse & Broad, Bayfield. Bates Art Bar, Broad Street, Bayfield. Apostle Islands Booksellers, Rittenhouse, Bayfield. What Goes 'Round/Bayfield Books, Second Street, Bayfield. Stone's Throw, Second Street, Bayfield. Orchard's Edge Quilt Shop, Rittenhouse & Broad, Bayfield. Sewing supplies. Eckels Pottery, Hwy 13 just south of Bayfield. Karlyn's Gallery, Hwy 13, Washburn. Art supplies & classes. Bell Street Gallery on Madeline Island. There are so many spectacular spots it’s hard to single any out! The region’s beautiful mixture of rolling hills, rocky crags, and tall pines offer some truly scenic hikes, giving nature enthusiasts the opportunity to enjoy the winter wonderland at its finest. Take a drive along Highway 13 for breathtaking views of Lake Superior ice formations, or out any country road to snowy farm fields and forests. Stop for the views that beckon — don’t forget your YakTracs, snowshoes or cross-country skis. Photo-ops abound! The “Blue Ice” photo at the beginning of this section was taken on Big Bay State Park point trail the same year the Ice Caves created their sensation. Bayfield County Trails. Madeline Island Trails. 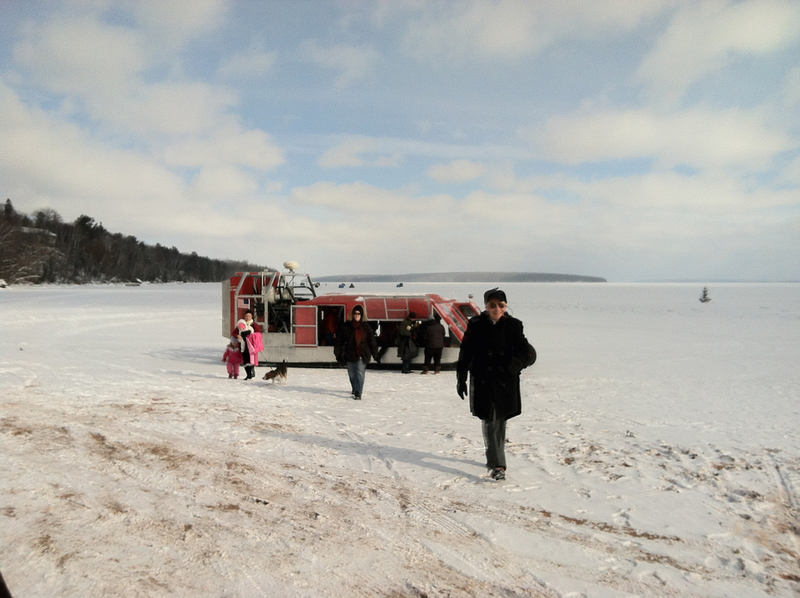 The cabin is just a few miles from the starting line of the yearly Apostle Islands Dog Sled Races! If you are a dog sledder, the cabin is the perfect place for your dogs to stay outside, since they won't bother anyone! The Bayfield area has some of the best dog sled training trails in the state of Wisconsin. A great area dog sled guide is Wolfsong Adventures. They have dog sled day trips and weekend adventures, where you can learn to drive a team of Siberian Husky sled dogs. They have been in business in the Bayfield area since 1997. In their Bayfield shop Howl Clothing and Adventure, they offer some very good outer-wear that keeps you warm, and has been worn in the Iditarod Race! Bayfield’s rugged and beautiful wilderness provides some of the most scenic ski and snowshoeing trails in the country — for all ages and levels. Mt. Ashwabay Alpine and Cross Country Trails Just south of Bayfield at the end of Ski Hill Road. Home to stunning trails perfect for alpine and cross country skiing, as well as snowboarding and showshoeing. Mt Ashwaybay hosts several winter activities and events. Mt Ashwabay offers 12 runs, and 35 km of groomed cross country ski trails, and a tubing and terrain park called Little Willie. Alpine skiers can enjoy more than 65 acres of chairlift-operated slopes, while beginners can develop their skills in their own exclusive area. Mt. Ashwabay also offers a competitive season for avid winter athletes, with NASTAR Races each Sunday giving skiers and snowboarders from across the country the opportunity to race — open to all levels. Mt. Ashwabay’s picturesque cross country ski area features some excellent routes for both classic and skate-style skiers, covering more than 40 kilometers. Also perfect for snowshoers, the trails are regularly maintained and monitored to keep them in prime condition for the whole season. Beginners can embark on the smooth Sugar Bush Trail, while intermediate skiers have the expanse of the Anchor, Seagull and Raven Trails. Advanced skiers can combine the Sugar Bush, Deer Path and Raven Trails to reach Mt. Ashwabay’s chalet. Mt Ashwabay also has some excellent runs for snowboarders. The Bayfield Chamber website features some excellent resources on more than 100 miles of snowshoeing and 130 miles of cross country skiing, including the Brownstone Snowshoeing Trail, Big Ravine Snowshoeing Trail, and Mt. Valhalla Cross Country Ski Trail. Many local businesses offer tours and events for cross country skiers and snowshoers. The Bayfield area, benefits from lake effect snow, so snowmobile riders can have an extended snowmobile season. We are close to many inland Bayfield County Snowmobile Trails. There is plenty of room at the cabin to keep your snowmobile and snowmobile trailer in the driveway! Bayfield County snowmobile trails are well marked and maintained by the Bayfield County Snowmobile Alliance using a high tech Sno-Plane groomer — reportedly the only one in Wisconsin. There are 600 miles of uncrowded trails throughout Bayfield County. Some of the trails are in non-developed national and state forests and parks. The peace and solitude gives you an unsurpassed experience. The interconnecting trail system allows you to travel to a number of restaurants in the area. You can call 800-472-6338 for current trail conditions or to receive a hard copy of a snowmobile map. Do you need to renew your Wisconsin snowmobile permit? Visit the Wisconsin DNR web page for snowmobile licenses and information. The Ice Caves became a world-wide phenomenon in 2014, after social media picked up on the opening after five years of no access due to warm winters. Tens of thousands of people from all over the world came to see the Ice Caves for themselves. The nearly two mile trail to the caves from the Meyer’s Beach access point near Cornucopia is actually over the lake — over the ice that forms during the winter season. Not all years are the same — sometimes the ice doesn’t get thick enough, sometimes it is extremely slick as in 2015, sometimes the trail is only open for a few days, sometimes the trail never opens during a season. But when conditions are right, the Ice Caves are truly a sight to see! Both the Apostle Islands National Lakeshore and the Bayfield Chamber websites report on conditions; be sure to check to see if they are open! Here are a few photos I took at the ice caves in 2014. I arrived at the Meyer's Beach area about 1 PM on Monday February 3, 2014. The lot was full, so I parked about 20 cars down the road from the main lot and made the half hour hike to the ice cave area, getting there about 2 PM. I took pictures up until sunset at 5 PM. The best time to visit the ice caves is during the week, as parking is easier, and there aren't so many people in the way of "just a landscape shot." Hauser's Bayfield Cabin is just 8 miles from the Meyers Beach access point! A cross-country skiing race across the frozen bay between Ashland and Washburn. The race takes place at night; the trail is lit by luminaries, and there are warming stations and entertainment along the course. You don’t have to race! You can ski, snowshoe or walk the course just for fun, too. Music and food at the end of the race in Washburn. Just before the bay freezes, the ferry travels through a “river of ice”. The Windsled (bring your earplugs!) runs for two to three weeks after the ferry stops and before it starts again, “either side of the Ice Road”. If the islanders are lucky, the bay freezes thick enough for the ice road to open, and they are no longer subject to a schedule to travel to and from the island! Sometimes the road is open for visitors to drive to the island, too. If you drive the Ice Road, please observe the 15 mph speed limit — this limit is not to keep you from sliding on the ice — it is to prevent the ice from oscillating, creating cracks that damage the road and shut it down for everyone! 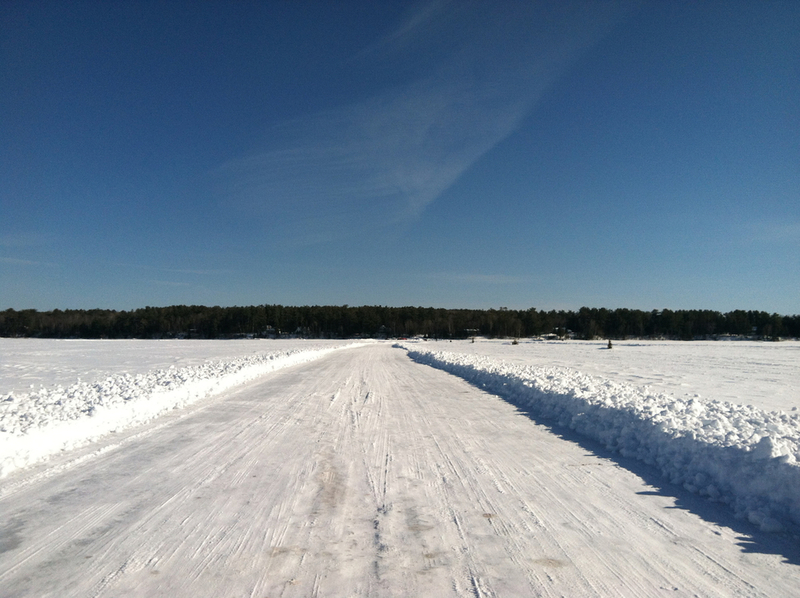 Check the Madeline Island Chamber website for schedule information for the Windsled and the Ice Road. Returning home to a warm, cozy fire at Hauser’s Bayfield Cabin to wrap up the day is the best part. Winter isn’t the season to hibernate — with so much to see and do in Bayfield, your great outdoor adventure can be as exciting or as relaxing as you want it to be!